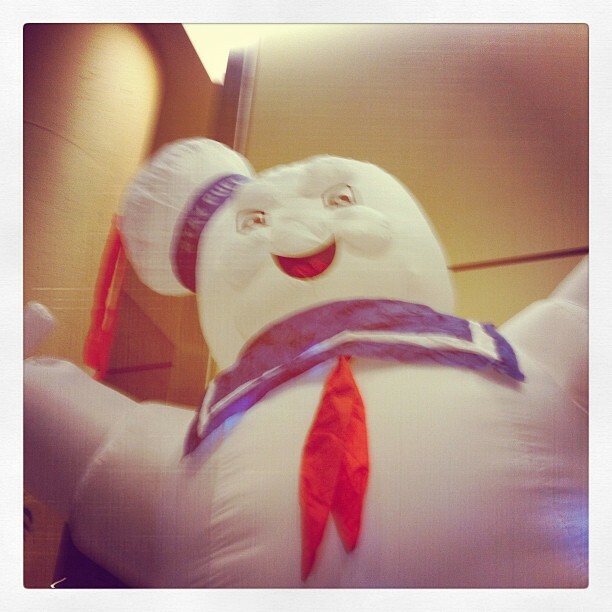 So another Fan Expo is in the books and it’s time to do some reflecting. This year was my first time with a media pass for the fest and thus I attended two of the four days, Thursday night and Sunday afternoon. Thursday became my walkabout day as the main hall was pleasantly less crowded and easy to maneuver, while Sunday was a work day as I attended some panels and conducted some interviews. The interviews will be along very shortly but for now we’ll start by focusing on Day 1. My first stop after attaining my pass was to go directly to visit my great friends at the Toronto After Dark Film Festival and find out what their first 10 films announced for the 2012 festival would be. The announcement should be live online at the link above by the time you read this, but at this time it was still under wraps. I’ll simply state that this is an extremely strong first wave lineup, and it contains a lot of films that I’ve been tracking for a while. Adam Lopez and company have not failed to raise the bar once again. On top of this, Toronto After Dark has released a limited edition T-Shirt/Poster by renowned artist Gary Pullin. It’s a beautiful poster and since Gary was gracious enough to sign all copies for free I managed to get an autographed copy that I’m sure will end up framed on my wall at some point. 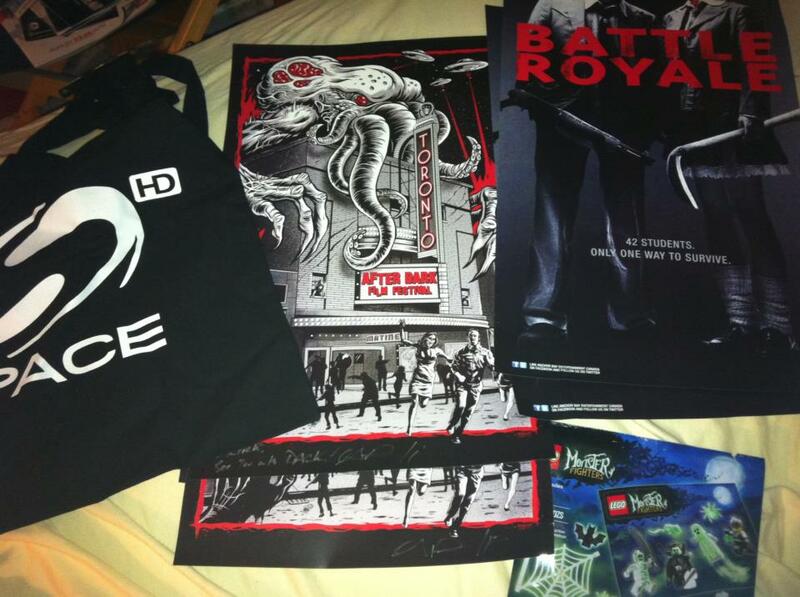 Next stop was the Anchor Bay booth where I acquired some goodies: a walking dead bag and some mini posters. It was there that I bumped into Justin McConnell, director of The Collapsed and curator of the Litttle Terrors Monthly Series that until recently was held at the east end rep cinema house, The Projection Booth. But as of September 19th the series will be re-launching in its new home in the heart of downtown, the Rainbow Cinemas Carlton. To celebrate they have instituted a ‘Best Of Little Terrors’ tour that launched at Fan Expo with two sold out standing room only showings on Friday and Saturday. I will have more on this tour and the films associated with it in the near future. Next I wandered through the multitudes of displays and vendors with standouts including the Frankenweenie exhibit, the free pic on a comic book cover from the DC booth and free Lego Darth Maul figure from, of course, the Lego booth. 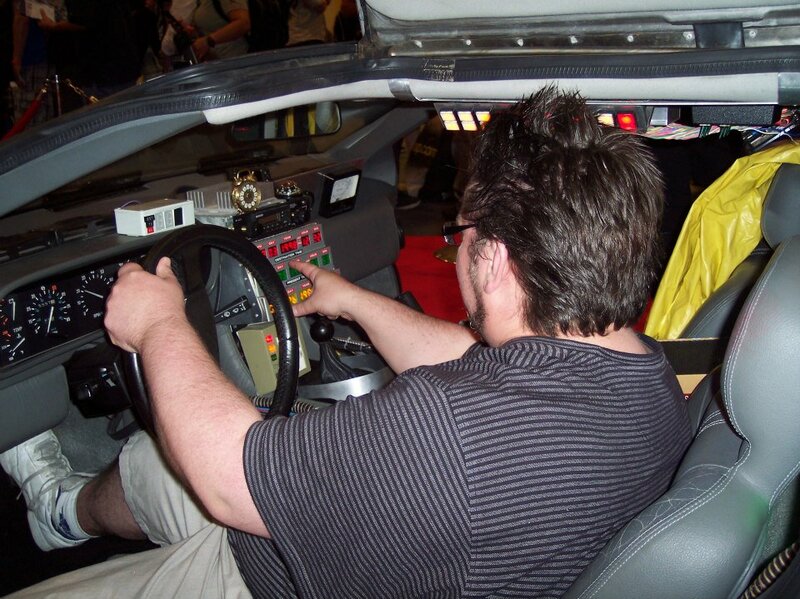 Along with running into some friends and getting my picture taken behind the wheel of an exact Back To The Future replica Delorean it was a fun day. My second day started off with the Dead Before Dawn 3D panel with cast members, including Christopher Lloyd himself. Along with being fun and informative it was also research for what would come later. After another quick stop in at the Toronto After Dark booth to check in on the boys and the Underground Peep Show gang across the way, I was back on my way to Anchor Bay. After arriving there, and managing to snag a sweet full sized copy of the amazing Excision poster, I was lining up with some other critics to interview the cast and director of A Little Bit Zombie. The interviews were great fun and featured Casey Walker, Kristopher Turner, Shawn Roberts and the stunning Crystal Lowe. All of them were really great to talk to. Ending it off with a signed poster from the gang minus Crystal, who had taken off to go do her own shopping for graphic art (love this woman! ), it was off to my next interview of the day. Upon reaching the Dead Before Dawn 3D booth I noticed a very long line for autographs, probably spurred on by the film’s other star, Devon Bostick, autographing for free. Initially I was unsure how we would be able to fit the interview in. But the Writer Tim Dorian and Director April Mullen were very accommodating in talking to me as I had the interview booked with them but still managed to get in a few words from another cast member to boot. You should be able to read both those interviews very soon here on Entertainment Maven. After some more roaming around and picking up some more schwag, I ended the day by sneaking into one of the smaller panels to get off my feet and hang with some friends. Earlier in the day I was almost bowled over by a passing Lou Ferrigno, so it seemed only fitting that my day would end standing shoulder to shoulder with Christopher Lloyd himself as he passed by. 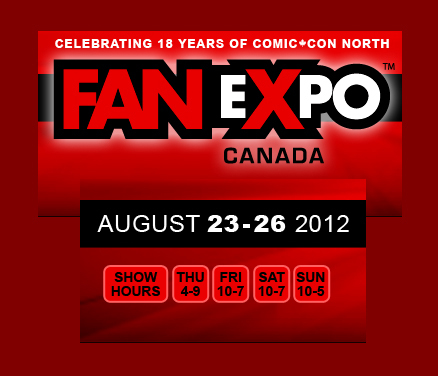 And with that my adventures at Fan Expo 2012 came to an end. One of the hottest shows on television today, out on DVD and Blu-Ray this week from AMC and Anchor Bay Entertainment is The Walking Dead Season 2. With all the behind the scenes turmoil involving the release of co-creator Frank Darabont mid-season as show runner, many people wondered if the show would suffer in quality because of his departure. Fortunately the second season proves that the dead are still running strong. Starting perched on a lonely rooftop, walkie talkie in hand, Rick Grimes (Lincoln) recaps briefly the recent events from the final episodes of Season 1 over the device, aimed at reaching the man who helped him back in season 1 episode 1, Morgan. This leads us into a fragmented season 2 as it is split into two parts, separated by two months in its original network airing, the first-half focused on the children of the group and the last dealing with the resolution of the Shane (Bernthal) storyline. As the group leaves the remains of the CDC they run into a herd of the dead causing the group to lose Sophia (Madison Lintz) as she runs off petrified into the woods, Rick in chase. Rick draws off some walkers from Sophia’s trail, but ends up losing her in the process. 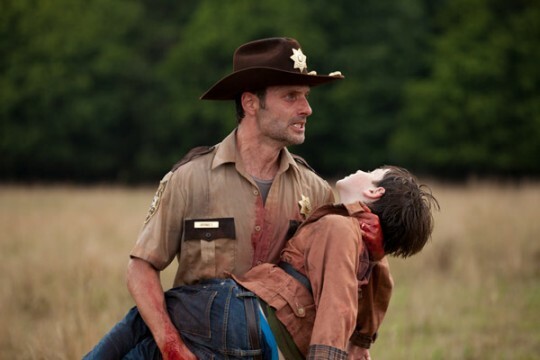 During the preliminary efforts to find Sophia, Rick’s son Carl (Riggs) suffers a horrible accident that takes Rick and company to the farm of Hershel Greene (Wilson) for help. 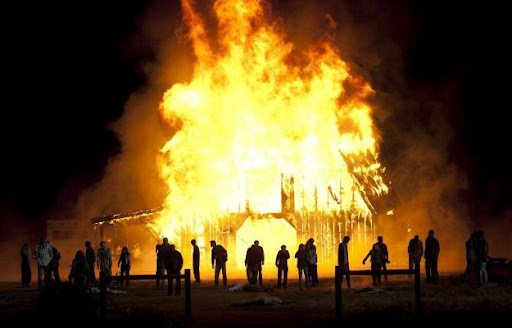 The crowd is temporarily segmented as Lori (Calles) joins Rick, Shane and Hershel’s clan in caring for Carl while Dale (DeMunn), Andrea (Holden), Darryl (Reedus), Glenn (Yeun) Carol (McBride) and T-Dog (Singleton) are left roadside looking for Sophia. Needing medical supplies to treat Carl, Shane and Otis (Vince) take off to an overrun Fema shelter while time becomes of the essence for Carl’s survival. The rest of the group slowly reconvene at the farm, while still sending out search parties for Sophia, and Glenn develops a relationship with the attractive farmer’s daughter Maggie (Cohan). Debate sparks over the treatment of the walkers and how long the group will be allowed to stay, as Hershel does not agree with Rick and the rest of his group, all the way up to the shocking mid-season finale. The second-half of the season deals more with Shane’s descent into madness as Lori unveils a life altering secret that forces him over the edge. After Rick, Hershel and Glenn have a nasty encounter with some other survivors, Hershel begins to see Rick’s point of view and realizes correctly that the humans left are just as dangerous if not more than the walker’s presence. The season ends with members of the group not surviving, as the show proves yet again no one cast member is safe, and the farm becomes overrun. The group starts again on the road looking for salvation, with Andrea separated from the rest of the group desperately struggling to survive. We are also introduced to a pivotal new character from the original book series that fans have been clamoring for. The Walking Dead features some of, if not the best, writing on television. Suspenseful and filled with dread, the scripts aim to tell stories and develop characters rather than just apply jump scares and gore all over the place. Many complained about the slow burn of the season with the Sophia storyline playing out over the first seven episodes and the drawn out story of Shane over the last five before the action packed finale. That said, both stories play out much more satisfying the second time around when you know where they are headed as many little nuances in the script and performances come to light when you know how they will play out later. This style of intelligent writing has been evident since the beginning, and since the original material of Kirkman’s Graphic Novel series is so ripe with carefully written material to begin with, it begs to be tapped into. On top of the writing, the show has brought together one of the strongest ensemble casts on television. With many Darabont regulars like Holden and DeMunn supporting our leads Lincoln, Bernthal and Callies, the supporting cast may actually be the strongest part of the show. DeMunn’s Dale is the conscience of the group and Shane does not fool him for a second. Holden’s Andrea transforms from suicidal and ready to give up to a fiercely determined deadly soldier in the groups ranks. The Rick/Lori/Shane triangle is resolved and Lincoln’s Rick evolves as an even stronger leader as Bernthal’s Shane proves exactly why he shouldn’t be in charge of anything during the mid-season finale. Wilson is a welcome addition to the cast as his Hershel provides both a companionship to Rick as well as an adversary. Eventually and begrudgingly Hershel comes to see that Rick is correct. Wilson’s performance lends gravitas and a seasoned presence that is welcomed to the show and will be welcomed in the new season considering the loss of one character in particular. The effects from Greg Nicotero and crew are top notch. Most studio film productions can’t compare to the effects work being put forward here. This helps lend to the overall cinematic feel of the show. The disc is loaded with extras as we get over an hour of behind the scenes featurettes, all of which are well done and interesting to watch. We get five episodes with commentaries from writers, directors, producers and cast, and while they can be dry in tone they are full of information. 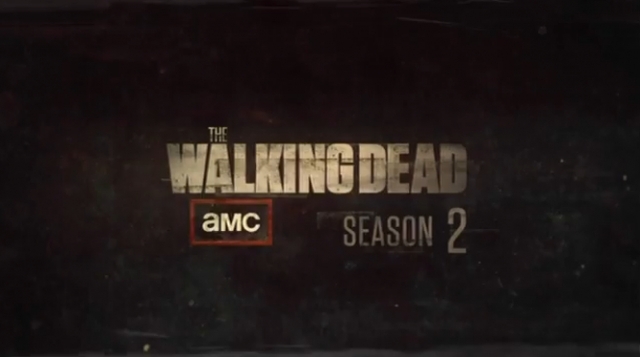 Deleted scenes from eight of the episodes are also included here along with all of the segments, including commentary by director Nicotero, of the six-part web series based on one of the series’ most iconic walkers. All in all, the DVD/Blu-Ray provides a great set of behind the scenes footage. 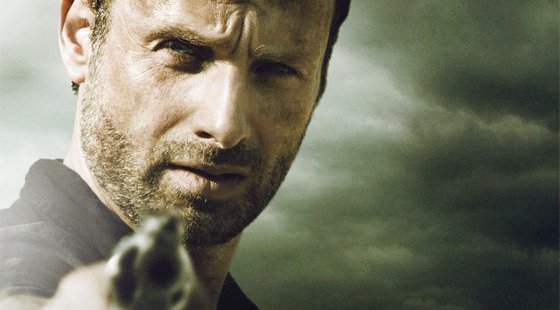 Is the Walking Dead Season 2 worth the price? You better believe it is. 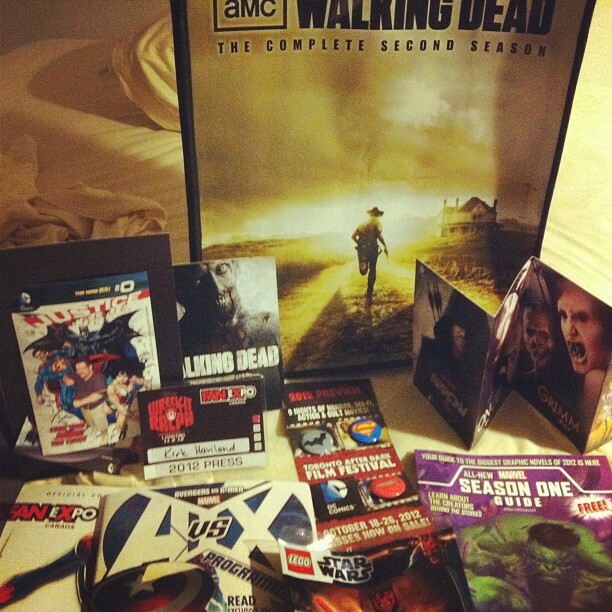 The Walking Dead Season 2 is a MUST OWN. Make sure to keep up with what’s going on at Entertainment Maven by liking our Facebook page and having updates delivered right to your Facebook News Feed. It’s the only way to stay on top of all of our articles with the newest blockbusters and all the upcoming films and festivals in Toronto, as well as our expanding Home Video coverage.